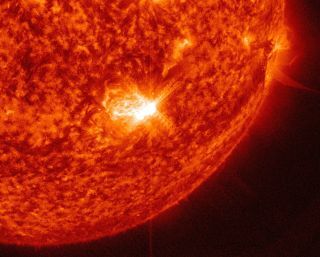 At 10:53 a.m. EDT (1458 GMT) on Sept. 28, a solar flare caused a blackout in low-frequency radio communications over South America and the Atlantic Ocean, with weaker effects farther out. The unruly sunspot may prompt more solar flares, according to NASA. An intense solar flare took out low-frequency radio communications over South America and the Atlantic Ocean earlier today (Sept. 28), and the unstable sunspot is likely to erupt again. NASA's Solar Dynamics Observatory spacecraft captured an amazing video of the solar flare from space. Sunspots are caused by knots and complications in the sun's magnetic field, and the particularly tangled field within AR2422 generated this recent solar flare when it released a buildup of magnetic energy suddenly — causing a burst of high-energy radiation that rushed to Earth and supercharged the atmosphere. Scientists do not expect an associated coronal mass ejection, where physical gas ejected from the sun hits Earth. That M7-class flare was strong enough that the extra atmospheric charge interfered with low-frequency radio communications over South America and the Atlantic Ocean, with weaker effects farther out. And there's a chance that sunspot AR2422 may release more solar flares. "AR2422 has an unstable 'beta-gamma-delta' magnetic field that could erupt again at any moment," Spaceweather.com said in its forecast. At the time of this writing, there was a 40-percent chance of another, similarly sized solar flare and a 5 percent chance of a powerful X-class flare during the next 24 hours. X-class flares can cause planet-wide radio blackouts and radiation storms, and are 10 times more powerful than M-class flares. An M7-class solar flare Monday (Sept. 28) burst from an active sunspot and caused radio blackouts over South America and the Atlantic Ocean. The sunspot responsible, Active Region R2422, is visible in the lower right of this image, taken by NASA's Solar Dynamics Observatory spacecraft. NASA's Solar Dynamics Observatory is an observational spacecraft that has been orbiting the sun since 2010, taking incredibly high-resolution images of the solar surface, gathering data about the sun's magnetic activity and helping to predict solar storms' impacts on Earth.